My Little Pony games are as popular now as they were almost 40 years ago. The iconic little ponies have made a comeback in a big way and if you, like me, grew up in the 80s chances are you would have owned at least one. If you yourself, as a male, didn’t own a magical pony with a rainbow colored mane, then you probably had your Action Jackson action figure ride one into town or you would have maimed and disfigured your sister’s a la the destroyer of toys, Sidney “Sid” Phillip, from Toy Story. Fast forward twenty years or so and if you, like me, have a daughter of school-going age then there is no doubt you would have to hear how the evil Nightmare Moon is free from her imprisonment and Princess Celestia has gone missing and to save her Twilight and the other ponies must find six magic stones called the Elements of Harmony, hidden in the mysterious Everfree Forest. My Little Pony or MLP, the revamped TV series, specials, and films dating back to the 1980s not only appeals to the little girls that the toy line is primarily marketed to, but it has drawn a cult following of teenagers, self-proclaimed “geeks,” and even adults. In fact, I recently bought myself a rather retro looking MLP t-shirt. In terms of toys and games you can get everything from colouring books and puzzles to spectacular castles and crazy colorful clothing. If you do have a MLP fan in the house there is no shortage of gift ideas and stocking fillers. 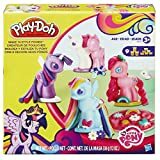 Encourage creativity and independent play with the My Little Pony Play-Doh set. You can create all kinds of my little pony friends with the nine rainbow colors, including earth ponies. pegasus ponies, princess ponies and unicorns. The four pony bases and book-molds help shape your unique ponies and to finish them off, simply add your very own cutie marks. It’ll provide endless hours of fun for your MLP fan. 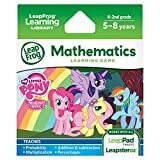 Learning addition and subtraction, multiplication, percentages and a whole lot more is fun with Leap Frog’s My Little Pony Friendship is Magic game. While learning basic mathematical fundamentals your little one will help solve riddles, recover the Elements of Harmony and bring Equestria back into balance. Adventures galore and fun challenges will entertain and educate with the Leap Frog game. The game works with LeapPad Ultra, LeapPad2, LeapPad2 Power, LeapPad1, LeapsterGS and Leapster Explorer (all sold separately). As families go back to basics and enjoy more family time, board games are becoming popular again. Similar to the classic Monopoly, the My Little Pony Monopoly board game lets you buy, sell and trade for your piece of Ponyville while still remembering the importance of friendship. From Cutie Mark Clubhouse and Sweet Apple Acres to Canter lot and Crystal Empire, you can play a 60-minute speed option or the traditional version. One of the best My Little Pony games for the entire family, the sweet little board game includes six colorful tokens and 22 popular locations. It’s the same game with the same rules; it’s Yahtzee, America’s number 1 dice game but with a My Little Pony twist. Have fun rolling the custom dice featuring your favorite cutie marks, to land on classic combinations like full house, straight or five of a kind to win at My Little Pony Yahtzee. The classic board game The Game of Life now has a special My Little Pony edition. The set comes with four collectable pony figurines and replaces the game’s traditional play money with “Friendship Points.” Fantastic adventures await the whole family as you journey through Equestrian and on to the Summer Sun Festival, all the while completing challenges and learning the true meaning of friendship. My Little Pony Chutes and Ladders was inspired by the classic game of ups and downs or snakes and ladders. 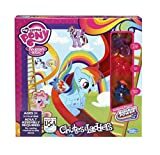 The MLP version includes a game board, three My Little Pony mini figures to use as play pieces, Princess Twilight Sparkle, Pinkie Pie, and Rainbow Dash, a spinner, three rainbows with cloud bases, one Gem Coin, and instructions. The rules are similar to the original games but it’s all rainbows and sweet little ponies. The board games is bright and colorful, holding the attention of younger players and the spinner is the ideal size for small hands. Young and old will enjoy this My Little Pony games version of the traditional ‘chutes and ladders’ games. Everyone is going to love the Poppin’ Pinkie Pie game. Pinkie Pie is all about surprises and fabulous birthday parties and you’re going to love this fun little game. You need to help decorate the cake, and the more you do, the more excited Pinkie Pie gets…until she pops out of the cake. If you’re doing the decorating when she jumps out the cake then you’re the winner. After the shrieks and squeals of delight have died down, it’s easy to start the next game. Have any favorite My Little Pony games you want to share? Let us know your picks in the comments below! Feature image courtesy of Flickr, DASPRiD.